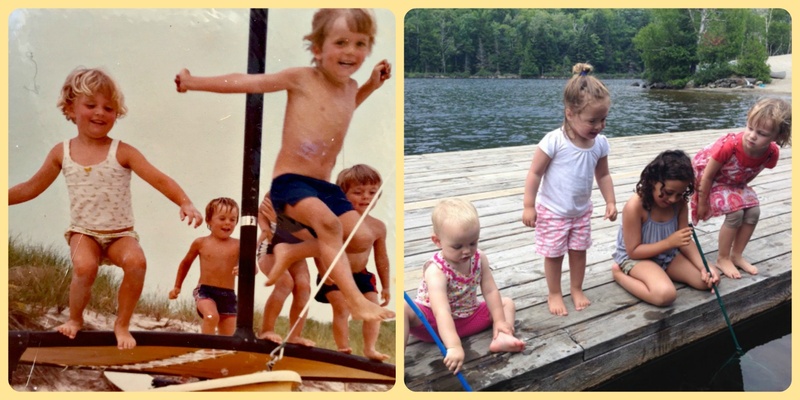 Me and my cousins during our Long Island summers (left) and my daughters and their friends in the Adirondacks last summer (right). My first and most emphatic answer is free play. Get outside! Explore, create, build, discover - all of these wonderful verbs that need little preparation and minor supervision, but can be fun and educational for all involved. Asking questions, wondering, discussing, looking up answers – all of these are ways to help facilitate your child’s discovery and learning over the summer. While I try to be mindful of screen time, I do indulge in the occasional, “can we ask your phone, Mummy?” I have to admit that I do learn quite a bit in my internet searches while finding out things like, “what do banana slugs eat?” Most often, we’re out mucking about in the morning, and then my 5 year-old and I look up answers while my 2-year old naps in the afternoon. Summer is just as vital to a child’s development as the academic year. Children need vacations in the same way they need sleep – to be able to let their minds and bodies process all they have learned. It is important to allow them time to apply all they have learned to world experiences, and in ways that seem fun and interesting. Time that can be devoted purely to play, and especially independent play, allows them to question, predict, infer, and discover on their own. It is just as important to occasionally let kids become “bored” and give them time to sort out a solution to that feeling. Don’t be afraid to let your children have the summers that we, as adults, get nostalgic for. Mine was a couple of hours at sports camp, followed by riding my bike to the beach with my friends. We would meet our parents there for lunch and then quickly left them again to explore, swim, collect, build, and then ride off on our bikes for some other adventure before returning home for dinner, family games, and reading before bed. One of my favorite recurring summer memories from my childhood is that of putting on plays for our parents. My family and two others would vacation near each other, and get together for big family dinners. After we had finished, Bess, the eldest girl, would direct us in staging plays for our families. We would disappear into the living room while the adults lingered at the table, and then one of us would be sent to formally welcome them to come to our performance. We were busy, engaged, collaborative, and imaginative – and delighted our parents with our antics. My kids’ summers may not look exactly like the ones from my childhood, but I try to work in these elements. I hope you and your family have a wonderful summer filled with play, discovery, and imagination!